There readings were done for the December 3, 2011 interview with the Time Monk Radio show – the were done on the evening of December 3, 2011 and were uploaded to the site at this time. 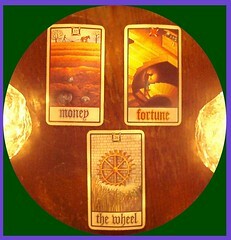 They are simple, 3 cards (in one case 6 card) readings that give an energy snap-shot about certain years and questions. 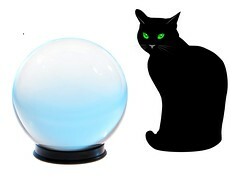 They are not intended as full readings or hard forecasts of the future, rather they are a general guide to the main energies that may be affecting the world in 2012, 2013 and other questions. The cards for 2012 do not look very good, but seem to involve entrapment, lies, and deception rather than major Earth Changes, at least MARJOR themes shown just in the three cards. This doesn’t mean that major earth or cosmic events will not occur, just that at this time the cards foresee the dark forces of human caused problems to be in the forefront of our concerns. The Prison Card could be people feeling trapped in their situations and/or nations becoming trapped/imprisoned in a web of their own making. Whatever the traps are, the premise they are based on in false and a lie. A major energy of next year will be continued attempts by the powers that be to distract people from the real issues and continue down paths based on a falsehood or false belief. Finally the friendship card provides both warning and hope; warnings to avoid “false” or “lying” friendships, but also to look for true friendship when dealing with hard times. 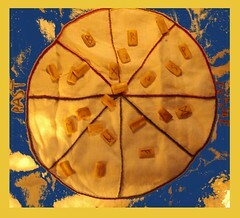 Friendship may prove to be one of the strongest themes of next year and being the final card may be even more important as the 2012 solstice approaches than it was before. For the next year the cards are even grimmer, with the Home (as in both personal home and home as nation/homeland/Earth) as the number one focus for the year. The Body Card indicates both health (and disease) and/or a threat to material existence. This does not mean everyone is equally at risk or that “We’re all Gonna Die” but it does mean (when taken with the next card) that there are likely to be many threats to the homes and bodies of individuals in 2013. This is when Earth Changes/Geological problems may be more profound than in 2012, while the cards are not directly calling for earthquakes, volcanoes, tsunamis etc., the energies for them playing a major role in 2013 are more likely. The same would be true of wars and famines, which often man-caused, tend to take on a life of their own in spreading wide-spread human destruction. Finally, the Destruction Card itself provides a serious and dire warning that many things may face endings in the year 2013. In addition to homes, people and individuals; the institutions that caused the lies and false premises featured in 2012, may also cease to exist or have much relevance (a good thing more or less); what isn’t certain yet, is what may/can replace them. Given other future readings (not included here) this reading may also concern the outbreak and consequences of a “Great War” that builds up in 2012, but may reach full out conflict in the 2013. If that combined with Earth Changes/Geological /Weather/Non-human problems, the results could be very dire indeed. On the other hand, The Home card also provides a ray of hope, because while outside events may be totally without of the average person’s control; home as a place of relatively safety and the celebration of family (and true friendship holding over from 2012) is likely to be a very important feature of the year 2013. What are the most beneficial things for individuals to concentrate on in the coming year (2012)? Now (right now) is the time to work on both practical skills/material situation and keep your senses open to messages and information from the “other world” as well. That Other-world may be seen as you own inner-voice, direction from Spirit, your guardian angel or even an inner-hunch; but whatever it is, don’t be so caught up in the material skills aspect of being aware and ready for anything that may be coming that you lose touch with your inner-voice/instructor – everyone is going to need some of both. Wow, these cards for the nuclear accident in Japan proved the most difficult and complex to look at, probably because they cover more than one situation and outcome. I’ve included six cards that seem to represent the main, long-term outcome of this event. To do a proper reading would require more cards and time than I have allowed for during a short reading. The basic information is that the situation is very depressing (the Cave) and is Now so bad that people (including the authorities) just want to hide from it, in fact these cards may also be about the attempts to “bury” the information “underground” and/or be about the destruction underground/cave that we can’t see but is still there. The Beauty Card and the Tree, are probably the awesome landscapes and the roots of heritage that are being affected by the disaster. They may also refer to pride (the ugly side of the beauty card) that refuses to admit that the very foundations (roots) of the land/country have been affected. The amazing combination of the Tower and Destruction, which are two cards in this deck (whereas many standard tarot decks have simply “The Tower of Destruction”) really stands out for me. I think the Tower is both the Cooling Towers themselves as well as the “Strength” of the nation/land itself. The ultimate out-come of this accident is Destruction, at least of the local area and possibly below ground as well; this could even spread to much of the Nation of Japan (at least in its current form) but I would need a longer reading to be certain of that. Certainly the Roots of the Tree and its Branches are highly affected by this accident, the other reading of the Castle Cards is that no walls are strong enough to defend themselves from this destruction, as in the final card the Walls of the Castle Crumble and the enemy (in this case probably the fallout/radiation/melt down) bring it down and destroy it. Hopefully this is just the local area turning into a slag-heap for hundreds of years and not Japan as a whole. Let’s hope so anyway and maybe revisit this question in a few months when the energies have more time to settle.